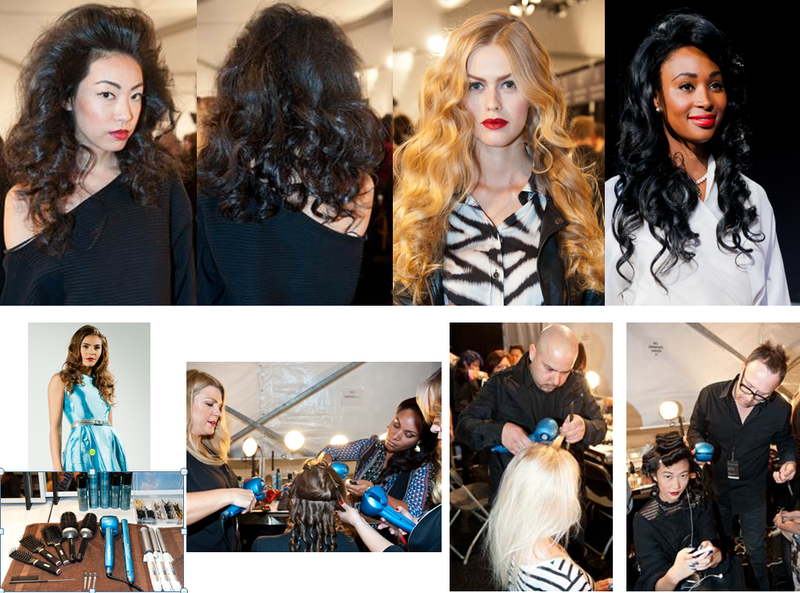 The hair of the models were tousled with loose, flowing curls. Lead hairstylist, Jose Perales, Creative Director of Babyliss Pro created the soft, dreamy hair-look by using Babyliss Pro MiraCurl, an automatic professional curl machine (seen in the pictures above). Begin by dividing hair into three sections – left, right and middle. Curl large sections of the hair – 1 ¼ inch or greater – away from the face, using a large barrel curling iron. Pin in place to set. Next, begin curling small 1 inch sections of hair using the Babyliss Pro MiraCurl. Starting on the right side, curl hair using the tool’s setting fixed on left rotation. Repeat on the left side, with the tool’s setting fixed on right rotation. This will ensure that curls angle towards the face. Pin each curl to set, and then blow dry the hair using a diffuser, on a cool setting. Leaving the middle section of hair pinned, brush out the right and left side curls using a bristled brush. Start at the root and work down to the ends. Perales recommends using a hairspray, such as Babyliss Pro MiraCurl Hair Spray, while brushing to eliminate frizz. Move on to the middle section, releasing it from the pins. Beginning in the back, working toward the front, tease each curl with a bristle brush at the root to create the illusion of thicker hair with more volume. Lastly, brush the middle section back and secure with Babyliss Pro MiraCurl Hair Spray. The Babyliss Pro MiraCurl may be purchased by licensed hairdressers and cosmetologists through a professional beauty distributor or store, and range in price from $199.99 -$249.99.